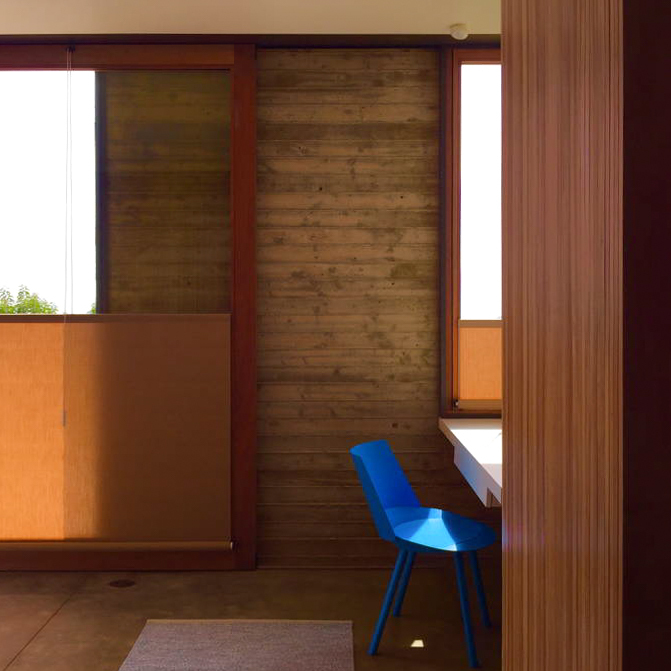 “The Saddle Peak House is a secluded retreat in the Santa Monica Mountains overlooking the Pacific Ocean. It offers a sublime and timeless place within the wild part of Southern California that has existed for generations but which very few have experienced. The 1.9 acre site includes a main house with three bedrooms and two bathrooms and a detached studio over the carport with one bedroom and one bath. In the main building there are two bedrooms with a shared deck facing the rock and the pool. The living room, dining room and kitchen fill out the other wing of the plan with views of the Pacific to one side, and the pool, rock and studio to the other. The living room and kitchen also have adjacent decks that have been carved into the plan. As the natural contours fall away, we capture a beautiful space for the master suite – with a king size bed, bathroom, writing desk and walk in closet – and the only earthbound room in the entire project. When you open the master suite's large sliding door, you are on grade with sweeping views of the Pacific and, to the south, the floating structure of the living room as it hovers above the landscape. The studio includes a bedroom, living room, kitchenette and bathroom. The living room’s convertible sofa allows the studio to function as an autonomous house for a second family. The house explores several oppositional relationships – heavy vs. light, transparent vs. opaque, rooted vs. floating – that combine to create a harmonious sense of balance and encourage a profoundly intimate experience of nature. The house is quite modest in terms of interior square footage but the sweeping experience of the mountains and the sea is almost overwhelming. The house blurs the boundaries between inside and out with giant sliding doors opening onto three decks and allowing the mountain breezes to pass through. One side of the house looks over the Pacific Ocean, feeling very much like a bird’s eye view, while the other is earthbound and intimate, taking in the massive rock outcropping reflected, together with the sky above, in the pure geometry of the infinity-edge pool.